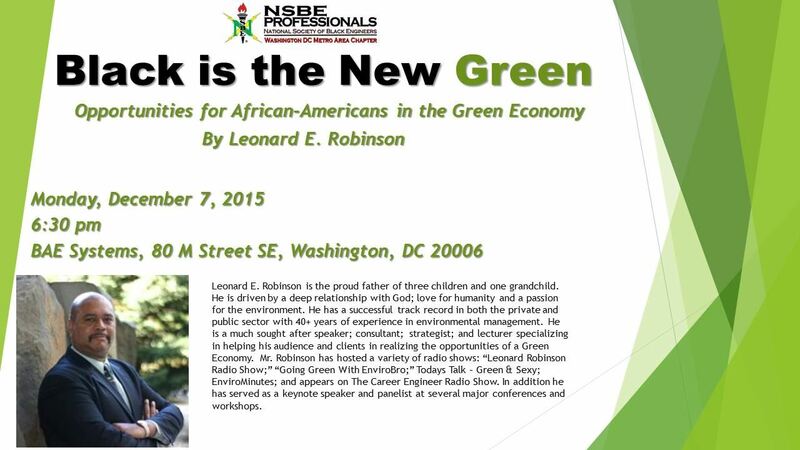 National Society of Black Engineers, Washington DC Metro Area Professionals Chapter (NSBE DC) - December Professional Development Meeting: "Black is the New Green"
December Professional Development Meeting: "Black is the New Green"
Join NSBE DC for the December Professional Development Meeting featuring Mr. Leonard Robinson, who will speak about opportunities for African-Americans in the green economy in "Black is the New Green." Dinner will be provided. Cost is free for NSBE DC members and $10 for non-members. Leonard E. Robinson is the proud father of three children and one grandchild. He is driven by a deep relationship with God; love for humanity and a passion for the environment. He has a successful track record in both the private and public sector with 40+ years of experience in environmental management. He is a much sought-after speaker; consultant; strategist; and lecturer specializing in helping his audience and clients in realizing the opportunities of a Green Economy. The chapter will also share information with the membership regarding the vote to remove St Mary's County, MD from Future Innovators Scholarship (FIS) eligibility and add Calvert County, MD to FIS eligibility. A proposed timeline and mechanism for the membership to vote on the proposed measures will be shared tonight. Click here for more information.